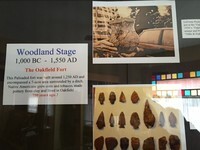 When you enter our Gold Room you will find our Native American room with a display about what the locals call the “Indian woods.” We at one time had one of the largest Indian forts here in Oakfield. 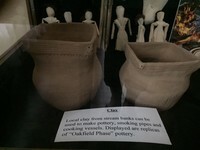 This was part of a chain of forts. 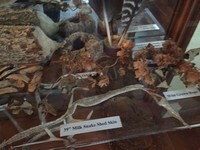 Many of our older residents remember playing in the Indian woods as a child. 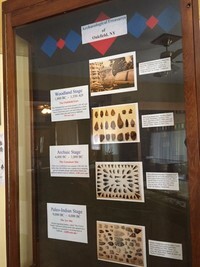 You will find a timeline of arrowheads and the people who used them. 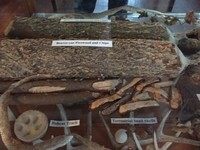 A beautiful display of nature – a log cut down by a beaver, prints from a bobcat, a snake skin and other natural items. 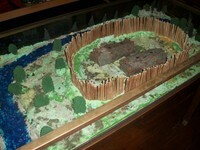 This is our diorama depicting the fort. 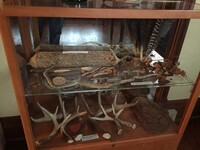 These artifacts are from the private collection of Mr. Larry Klotzbach. 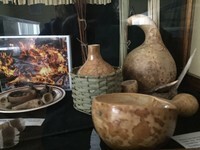 They are some pieces of pottery that were excavated by Dr. White. 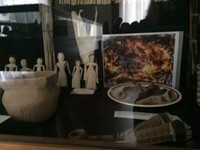 The different designs are really amazing. 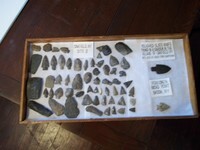 Bigger pieces of flint that are worked to make arrowheads. 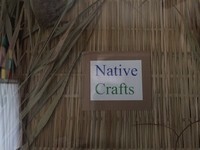 We have a fantastic display of native crafts this year. Remember there were no stores, they made everything themselves. 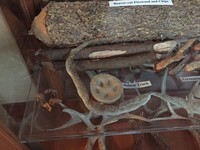 Bill Chase has carved fish hooks out of bone. 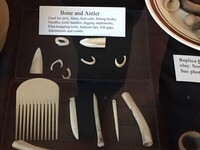 He has also made a turkey call from bone. 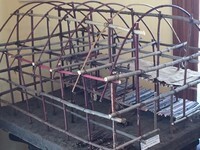 They are even working on a model of a longhouse.